Whether you’ve been quilting forever or just want to learn some beginner basics… Join us for an autumn weekend of sewing, sharing, & devotions as we ‘quilt at the cross’. Expert quilters and those who want to learn some basics of the craft are welcome to attend our quilters’ weekend at the Cross. The retreat will ‘stitch in’ selected scriptures and worship times with planned fellowship as we share our common interest of quilting. Come to laugh and learn from each other as we enjoy the beauty of the Cross and the Laurel Highlands in the fall. Intermediate and advanced quilters may want to bring along their current projects. Have special techniques or hints? We’ll be ready to listen & learn. Need to know the easiest way to “pop a knot” or the best end of the thread to knot? Helping hands will be right there. The Weekend Leaders: Dr. Barbara Beakley & Dr. Cindy Ridley are retired faculty members of Millersville University in Lancaster County, PA. 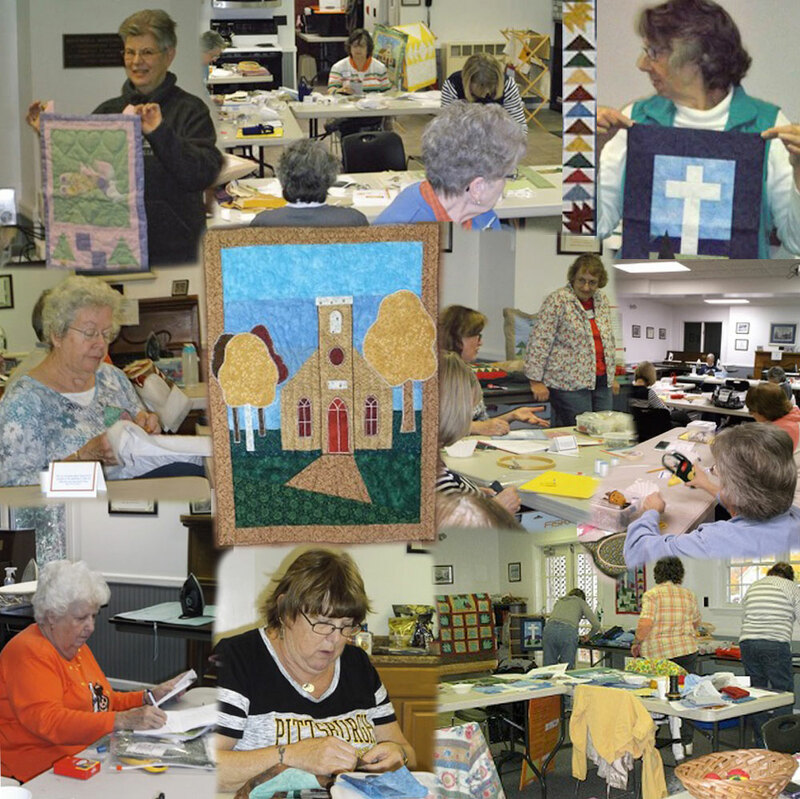 Both are members of the United Methodist Church and enjoy a variety of activities including quilting and camping. Barb is always working diligently on several quilting projects at different stages of completion, while Cindy tends to make any given quilt project last and last. While neither is an expert in the art of quilting, Barb & Cindy will lead you to share your faith and skills in this quilting experience. When the event becomes full, you may contact the Jumonville Office @ (724) 439-4912 to be placed on a waiting list. It typically fills every year, so you are encouraged to register early. EVERYONE IS SO WILLING TO HELP. THE CHANCE TO WORK TOGETHER & LEARN FROM OTHERS. I GOT TO COME TO JUMONVILLE AGAIN. THE PEOPLE I MEET – QUILTERS ARE FUN. THANKS FOR DEVOTING TIME & EFFORT IN PROVIDING THE EXPERIENCE. BEING WITH OTHERS WHO HAVE A PASSION FOR SEWING & QUILTING. GETTING AWAY, BEING IN NATURE & THE NOSTALGIA OF JUMONVILLE. MEETING THE GIRLS & LEARNING ABOUT ALL THEIR SEWING EXPERIENCES & ACTIVITIES. CINDY & BARB (THEY PUT SUCH EFFORT INTO PLANNING & IT SHOWS). TIME TO SEW & WORK ON PROJECTS, THE BEAUTIFUL PROJECTS WE WERE OFFERED. THE DEVOTIONS WERE PERFECT – RIGHT LENGTH, RIGHT CONTENT, & RIGHT SPIRITUAL DEPTH FOR THE CONTEXT. THE INTERACTIONS WITH OTHER QUILTERS. THE ORGANIZATION & PREPAREDNESS OF THE LEADERS. THE CALM ATMOSPHERE & DEVOTIONAL TIMES. THE ACCOMMODATIONS – BOTH THE ROOM WE STAYED IN & THE ROOM FOR QUILTIING. THE INSTRUCTIONS WERE GREAT…PATIENT & SO WILLING TO HELP US TROUBLESHOOT.